2018 is upon us and it’s time to create a new and improved strategy for all your digital marketing needs. 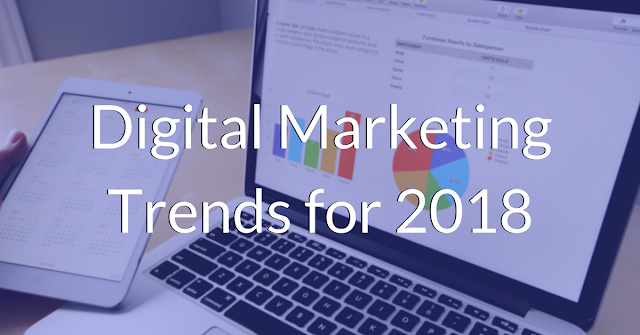 There are a lot of things that happened in digital marketing in the past year, and we suspect 2018 will be no different. There is always something new happening in digital marketing and to ensure that your company receives maximum benefits from the current trends, you need to stay updated. Let’s look at some of the things that are bound to happen in the digital world and how they will impact your company’s digital strategies. This year, voice search will become a mainstream idea—most of the communication that the users will have with their phone will be through voice search. This means that the long-tail keywords will play a key role in SEO. 10% of the Google visitors search through voice search and it is likely to rise in 2018. User experience has always been one of the most important aspects of web design and development. This year, with Google’s strict policies regarding user experience, it will garner even more attention from website owners. Focus on your website and enrich it with elements that enhance the user experience. This will help you increase your site’s ranking. This year we may see Mobile-first algorithm for indexing. And if you want to ensure that your business remains prominent among the 57% of the traffic that solely comes from mobile search, you need to incorporate SEO strategy for mobile. Visual search will likely go mainstream this year or in the coming few years. Either way, it is an emerging trend that will supersede the text search. The need for rich visuals will become a necessity in the coming days and therefore it’s important that you prepare ahead. Influencer marketing has helped brands create profound marketing impact that has resulted in positive cash flow. Influencer marketing is not going to die, at least not in the coming few years; it is still popular as ever. When you sit down to create your digital marketing strategy for this year, don’t forget to include influencer marketing. Search engine optimization is always evolving. This year, there are going to be some massive changes that may reshape the way you create SEO strategies for your business. Consistency is the key as always—makes sure that your digital marketing team understands the changing trends and is quickly learning the techniques that are necessary for improved SEO implementation. The active approach towards the changing digital marketing trends is the only way to maximize results. Plan for the year ahead and redefine your SEO and digital marketing strategy. Make sure that you incorporate the trends like voice search and video search in your overall campaign to reap substantial results. SEO needs can be different for different brands. This year, analyze your brand’s requirements and find the tactics that will work best accordingly.